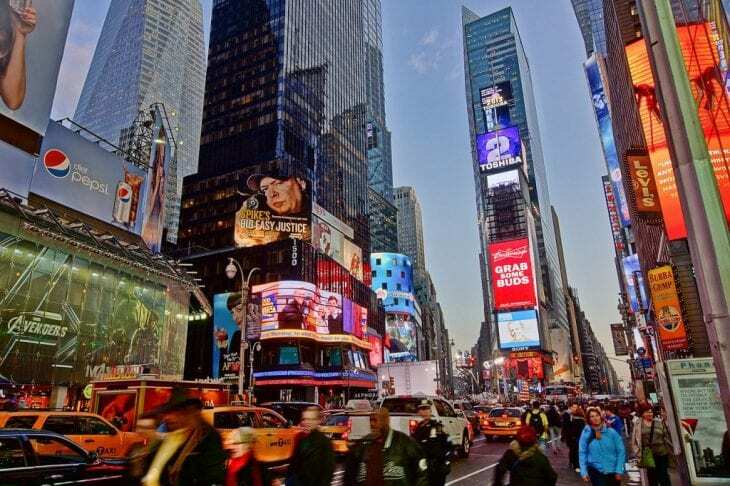 The world’s most famous square is located at the junction of Broadway and Seventh Avenue and stretching from West 42nd to West 47th Streets. It’s filled with video screens, LED signs, and flashing lights and is known to be a major tourists attraction. The lights and signs can be viewed anytime, but the most enchanting experience comes when one visits it at night, as all the signs and screens are ablaze with color. Times Square is also well known for its famous New Year’s Eve ball drop. The Las Vegas Strip is an approximately 4.2-mile (6.8 km) stretch of Las Vegas Boulevard South. The Strip is considered a scenic route at night. Many of the largest hotel, casino, and resort properties in the world are located on the Las Vegas Strip. 15 of the world’s 25 largest hotels by room count are on the Strip, with a total of over 62,000 rooms. 3. National Mall and Memorial Parks, Washington, D.C. Many of the nation’s iconic public landmarks are found in the 1,000 acres of the National Mall and Memorial Parks, including the Washington, Lincoln, and Jefferson Memorials, and the Korean and Vietnam War Veterans Memorials. The Smithsonian Institution’s 19 museums are also adjacent to The Mall. Located near the waterfront and today’s Government Center, it has been a marketplace and a meeting hall since 1742. It was the site of several speeches by Samuel Adams, James Otis, and others encouraging independence from Great Britain. Now it is part of Boston National Historical Park and a well-known stop on the Freedom Trail. The Magic Kingdom is the first of four theme parks built at the Walt Disney World Resort in Bay Lake, Florida. It is dedicated to fairy tales and Disney characters. In 2011 alone, the park hosted approximately 17 million visitors, making it the most visited theme park in the world for that year. The original Disney Park in Anaheim, California has been an American tourist attraction since its opening in 1955. In 2007 alone it was visited by nearly 15 million people. Its well-known rides range from Space Mountain to the Pirates of the Caribbean. The GGNRA is a U.S. National Recreation Area protecting 80,002 acres of ecologically and historically significant landscapes surrounding the San Francisco Bay Area. It is of the most visited national park with more than 13 million visitors a year. It is also one of the largest urban parks in the world, being 2.5 times the size of the San Francisco city and county. A collective name for three waterfalls that straddle the international border between the Ontario province of Canada and New York state of the United States. They form the southern end of the Niagara Gorge. From largest to smallest, the three waterfalls are the Horseshoe Falls, the American Falls and the Bridal Veil Falls. The area is a huge tourists attraction throughout the year. America’s most visited national park with more than 800 miles of protected trails, this natural wonder hosts approximately 9 million hikers, birders and drivers every year. Navy Pier is a 3,300-foot (1,010 m) long pier on the Chicago shoreline of Lake Michigan. The pier was built in 1916, its primary purpose was as a cargo facility for lake freighters, and warehouses were built up and down the Pier. The pier was also designed to provide docking space for passenger excursion steamers, and it even had its own tram. Today, Navy Pier is Chicago’s number one tourist attraction. are here, along with a full calendar of nighttime fireworks shows.